This 3 books were printed in January 2009, and will be presented for the first time at the Internacional Comic Festival in the french city of Angoulême: MOCIFÃO, written by Nuno Duarte, Nuno Silva and Untxura. 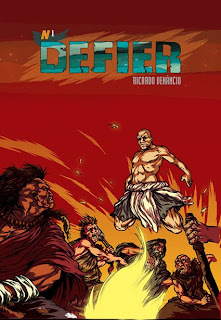 Drawn by Nuno Duarte; DEFIER, written and drawn by Ricardo Venâncio; YOUR ROTTEN FLESH, written by Pepedelrey and drawn by Osvaldo Medina. En portuguais, Pepezito, en portuguais. Com colhões edita-se em português. Já chegou ver a vergonha do Marco Mendes em inglês.